I’ve always, always been drawn to Greek food of every kind. I love lemon. I love spinach. I love feta cheese. I love dill. And I adore lamb! So if you were taking me on a hot date and you took me to a Greek restaurant, I guess you could say I’d be pretty happy. (I’m married though… so that hot date would have to be with my hot husband). 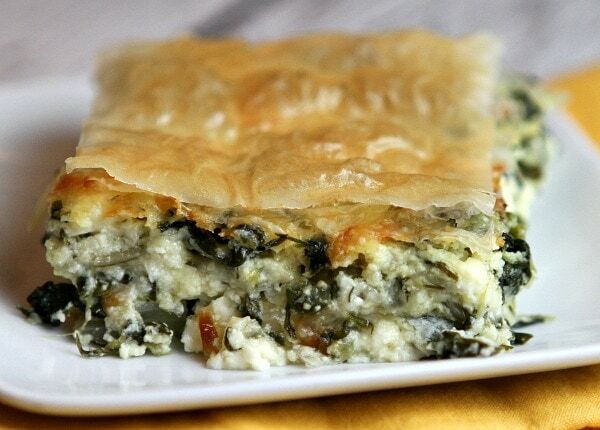 This Greek Spinach Pie recipe is a homemade version of the traditional spanakopita with a couple of twists. This version utilizes three cheeses: feta, ricotta and jack. There is dill. There is sauteed onion. This pie makes a great dinner item (my family loves it so I’m going to call it family-friendly!) It’s especially awesome served with Greek Lemon Chicken Orzo Soup!